Eligible for a Green Card? If you are seeking permanent residence status through your family, a job offer, asylum or as a refugee, you can apply for a green card. A Muskogee green card attorney can also share the many other special provisions that are available for those trying to receive permanent residency. At the Wirth Law Office – Muskogee one of our knowledgeable immigration attorneys can provide clear answers for the often complicated process of trying to get a green card. Family Based: Immediate relatives of U.S. citizens are given higher priority to receive a green card. They do not have to wait for visas to become available. There are no limits on the number of visas in this category. For other categories, there are a set number of visas that can be issued every year. That is why it’s important that your application is in order and ensure that there are no mistakes that could possibly delay the process. Jobs or Employment Based: If you’re looking to move to Oklahoma from another country for a job, you would need to receive a green card. A Muskogee green card attorney can help explain the different levels of preference the U.S. government gives to workers depending on their job category. Refugee or Asylum Status: If you’ve been admitted to the country as a refugee or have asylum status or the qualifying spouse or child does, then you’ll have to apply for a green card one year after entry. 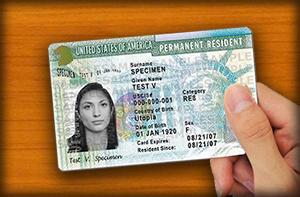 For more information on green cards for refugees, contact our Muskogee office to explain the many unique requirements for this type of legal document. Contact a Muskogee green card attorney at the Wirth Law Office – Muskogee for a free consultation today at (918) 913-0725 or call toll-free at (888) 447-7262. If you prefer to contact us by email, use the form at the top of this page or email firm@muskogeeattorney.pro. When you contact us about your unique immigration status our conversation stays between us.